Curtis Stone, home cooking, kale, pasta, spaghetti, What's For Dinner? 1. Bring a large pot of salted water to a boil over high heat. Add the kale and cook for about 5 minutes, stirring occasionally, or until tender. Using a mesh spoon or sieve, scoop the kale out of the water, draining it well, and transfer it to a bowl. 2. Return the water to a boil. Add the spaghetti and cook, stirring often to ensure it doesn’t stick together, for about 8 minutes, or until tender but still firm to the bite. Scoop out and reserve ½ cup of the pasta cooking water. Drain the spaghetti. 3. Heat a large heavy skillet over medium heat. Add ½ cup of the oil and the garlic and cook for about 30 seconds, or just until fragrant. Stir in the kale, add the lemon zest and season with salt and pepper. Add the spaghetti and the remaining ¼ cup oil and toss to coat. Stir in the lemon juice, followed by half of the cheese. Season again with salt and pepper. Stir in enough of the reserved cooking water to moisten the pasta as necessary. 4. Divide the pasta among four pasta bowls, top with the remaining cheese, and serve. 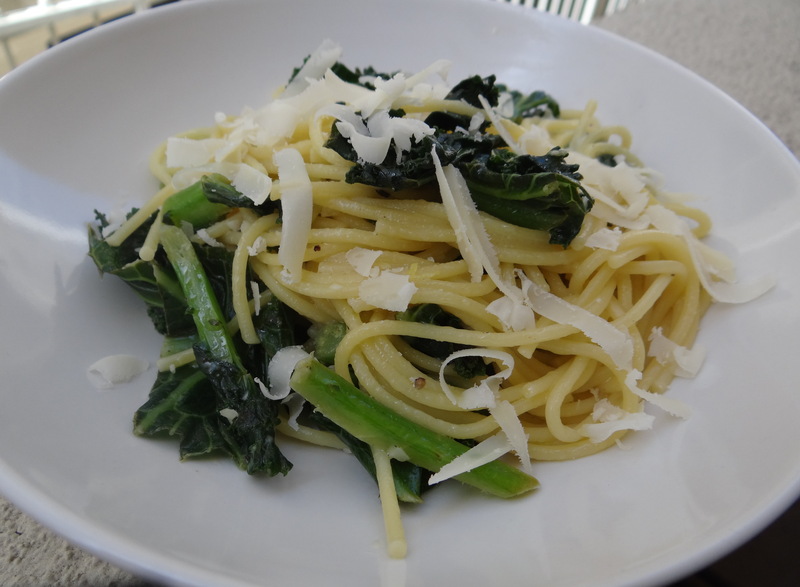 This entry was posted in: Curtis Stone, home cooking, kale, pasta, spaghetti, What's For Dinner?